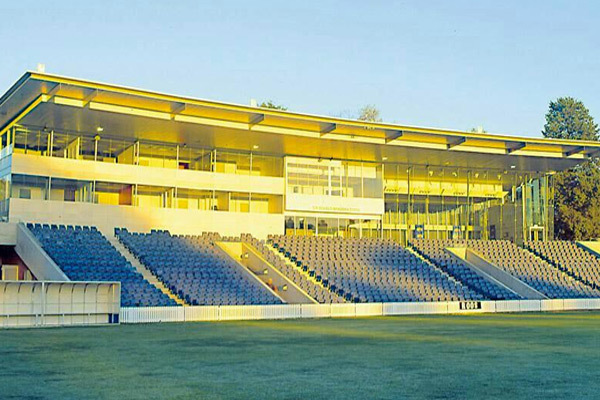 The scope of works on this project included the demolition of the existing Bradman Stand and toilet blocks. Followed by the construction of the new Sir Donald Bradman Stand which included a main foyer, lift, change rooms, briefing rooms, warm up areas, drug testing and medical rooms on the ground floor. On the first floor facilities for the bar, kitchen, function and board rooms were included along with the coaches and players boxes. The second floor consisted of office and control areas along with press and radio rooms. Externally the scope of works consisted of the inner and outer bowl seating, construction of two marquee platforms, two toilet blocks, a waste enclosure and the construction of a new oval drainage system. The Sir Donald Bradman Stand was designed and constructed in a three dimensional plane and was curved to the shape of the oval with the front facade on an angle to prevent reflection. The Project was completed on a very tight time line due to weather and a request from the Client that the facility be ready for the PM’s XI in early December 2000. The project team was able to meet this time line through intense programming, time management and resource monitoring.